Arthur Ford, the medium through whom Bishop James Pike said he talked with his dead son, was the most amazing psychic personality of our era. King George of Greece, Queen Maud of Norway, Upton Sinclair, psychologist William McDougall, astronaut Edgar Mitchell, and Aldous Huxley were among those who witnessed the mysterious powers of this man who was called "the enigma of our time." 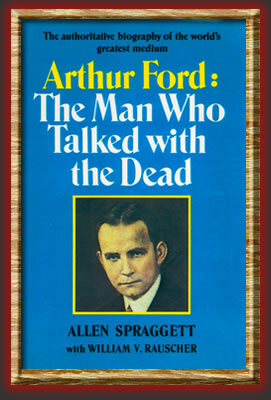 In this searching, definite biography - based on Ford's private papers, diaries, and letters, interviews with many who knew him intimately, and information from other firsthand sources - Allen Spraggett and William V. Rauscher probe Ford's extraordinary powers as a medium and his personal conflicts and triumphs. Here, documented, is the story of how Ford convinced a skeptical reporter of his astounding psychic powers by reading the man's mind; the explanation - including never-before-published details - of how Ford broke the famous Houdini code message and proved to Beatrice Houdini that her husband had communicated from the grave; and a careful evaluation of the Bishop Pike affair, with some startling revelations. This is the most candid, informed biography ever written of the world's greatest medium, who was also a remarkable human being.